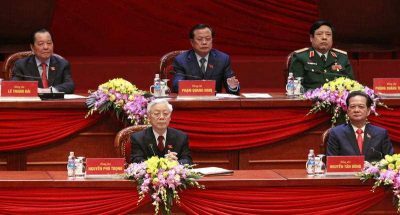 After one of the most highly contested Vietnamese Communist Party (VCP) elections to date, the incumbent General Secretary Nguyen Phu Trong was re-elected to the top post of the Vietnamese regime in late January. But victory in the elections is just the first challenge in Trong’s five-year term. The next major challenge for the new leader will be managing the relationship with China. While Vietnam’s top Party members were busy preparing for the country’s all important 12th Party Congress, China again sent the now infamous Haiyang Shiyou (HD-981) oil rig into contested waters at the end of 2015. China’s motivations were unclear. The move might have been part of Beijing’s grand strategy in relation to its territorial claims, or it might have been intended to create tensions during the VCP’s party elections — similar to China’s activities during the 1996 Taiwanese presidential election. Regardless of the real motivations behind it, this incident instantly caused problems for Trong. Trong is usually seen as more conservative and pro-China than his outgoing rival, the current Prime Minister Nguyen Tan Dung. Amid the rise of anti-China feelings among the Vietnamese public and VCP members, the new party chief is under great pressure to prove otherwise. Trong’s re-election comes at a time when Vietnam’s relations with China are much more precarious than when he first rose to power five years ago. Beijing now appears more determined to transform their sovereignty claims in the South China Sea into de facto occupation. This has been gradually pursued by the acceleration of island reclamation, rapid naval modernisation, and increased air defences. Throughout 2015, China undertook significant reclamation activities on several islands, reefs and rocks in the South China Sea. The most controversial and perhaps biggest project to date is on Fiery Cross Reef, where Beijing has built a 3000 metre airstrip, which can be used for both civilian and military airplanes. Many believe that this newly reclaimed island will be used as a potential control point for China’s military forces to project power in the South China Sea. Within a year, China has built seven strategic military bases in contested waters surrounding the Spratly Islands. Facilities on Cuarteron Reef, Johnson South Reef, Gaven Reef and Hughes Reef all feature at least one helipad, while there is a 3000 metre airstrip under construction on Subi Reef. Construction activities on Mischief Reef further include two military facilities and a potential naval base. What can be understood from this new wave of reclamation on the South China Sea? To begin with, given the unprecedented scope of the reclamation as well as the speed of the construction process, China has moved from threats to real militarisation of disputes in the South China Sea. Beijing appears to be using military power to create ‘facts on the ground’, forcing other claimants to accept China’s claims. Previously, China had made claims on large parts of the South China Sea, but in reality did not attempt to control the area. With these new military bases, along with Yulin Naval Base on Hainan Island, it now has the capability to do so. These bases can be used as hubs of logistics, control centres, intelligence gathering, patrolling and even to launch offensive moves if necessary. The type of control China is now aiming for is not limited to controlling the sea. The newly built infrastructure may also allow China to lay claim to an Air Defense Identification Zone in the South China Sea. In the first week of 2016, China conducted 46 flights in the Flight Information Region managed by Vietnam, which covers the air above the contested waters. The Chinese Ministry of Foreign Affairs has labelled these flights as ‘experimental’ — implying that China will continue with additional flights in the future. Although they have not been ruled as illegal under international law, all these acts can be seen as a part of China’s grand strategy to actively control the South China Sea — helping Beijing establish part of the so-called ‘String of Pearls’, a network of military and commercial facilities, through the busiest and most valuable sea lanes in the world. These new challenges from China present Trong with a serious dilemma. As a diehard communist who has been a Party member for 50 years, Trong is widely believed to have ideological sympathies for Beijing and has consequently been seen as too soft when it comes to the South China Sea dispute. The congratulations offered from President Xi Jinping, the first world leader to do so, and praises from the Chinese government mouthpiece The Global Times after Trong’s re-election may indicate that Beijing is similarly sympathetic to Trong. But, after the exit of the flamboyant Prime Minister Dung, who is popularly considered ‘pro-West’, Trong must show the Vietnamese public that he is strong enough to maintain the country’s territorial integrity. To do so, he must keep the West close and China closer. He has already escaped the image of a conservative apparatchik by being the first Party chief to visit the White House and by steering Vietnam to join the US-led Trans-Pacific Partnership. Last year, he also visited Japan, a perceived ally in sovereignty disputes with China. It’s unlikely these tendencies will be reversed during the next five years of Trong’s new term. The trickier issue is how Trong balances the relationship with Beijing, being torn between his communist ideology and the harsh reality of more aggressive Chinese expansionism. The result of his own struggle will not only define his legacy, but also the development path of Vietnam for the years to come. Does he intend to sign the TPP? Vietnamese style of leadership is collective, it should be understood that signing TPP was agreed by the VCP politburo, in which Mr. Trong holds the highest authority.